A face appears in Marion’s first painting–not just any face, the face of an elderly woman who just went missing from a rest home. What they hadn’t counted on was running into a serial killer. So much for retirement. 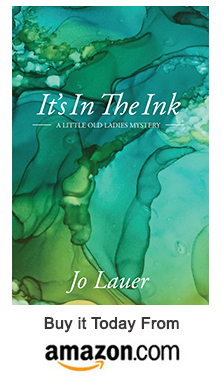 This is the second in A Little Old Ladies Mystery series. 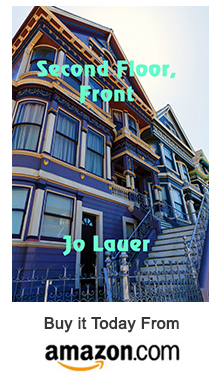 Second Floor, Front is a cross-over paranormal, psychic-sleuth/cozy mystery. Think Long Island Medium meets Long Lost Family meets Miss Marple. Or perhaps a lesbian version of Rear Window. In her efforts to make sense of what she has witnessed in the crosswalk below her second-floor window, Marion, recently retired with too much time on her hands, hooks up with Amanda, also retired, known for closing cold cases for the local police using her psychic “gifts,” along with her chutzpah. Humor and tragedy vie for attention as they blend their oil-and-water styles. 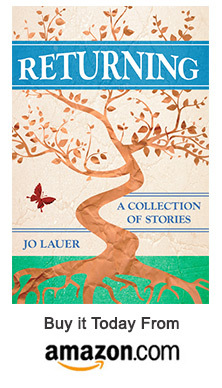 Returning is a collection of five stories connected by the theme of the heroine’s journey – women catapulted into the world, bumped, banged and honed by the process, who then return home (to a physical location, or a place of self-identity), changed, able to tackle the unfinished business of life. Paddle is introduced to a life she didn’t know existed outside the Louisiana bayou when a road trip deposits her in Berkeley, CA in the 1970′s. Marge has spent a lifetime searching for her daughter Emily, taken from her decades earlier by Emily’s “other mother,” only to miss her by minutes at San Francisco International Airport. B.J., Jewell, Bernina, and Gem, a loveable band of social misfits, makes their uniqueness work for them. KerKhar, an albino Miwok child, journeys across the land and over time in order to return to her homeland and reclaim her moment of peace. Cory grapples with becoming his real self, despite the hand that biology has dealt him. Tenacity of spirit, a dose of optimism, and curiosity of soul connect these unlikely sojourners. This collection contains gay- and trans-positive material. When Mab, a young black girl, chooses Happy Acres Rehab over drug and alcohol abuse and life on the streets in Oakland, she gets a second chance at pulling her life together. Shalese, a young lesbian alone in the world after her beloved grandmother dies, hops a Greyhound bus from Detroit and travels to San Francisco where being gay is more acceptable. She has big plans of helping female ex-felons by establishing a halfway house. Jenny grows up a privileged white child in Akron. Conflicted about her sexuality as she matures, she considers her heterosexuality a passing phase. Wanting to escape a meaningless life, although indulged by money and luxury, she journeys to San Francisco and becomes one of the ex-felons in need of Shalese’s halfway house. Is it fate or mere serendipity that brings together these unlikely sojourners and changes their lives forever? A Victorian mansion in a swanky San Francisco neighborhood is the setting for The First Step, a recovery house for a colorful cast of female ex-felons. Florence, the wealthy octogenarian benefactress, has underwritten blue collar social worker Shalese’s dream. At what price do our dreams come true? Is someone really getting away with murder? When Shalese’s ex-lover Mab—lesbian bar owner by night, PI by day—uncovers Florence’s unsavory history, the women of The First Step find themselves temporarily homeless. Turning grapes into wine, Shalese, her partner Jenny—a trust-fund baby and ex-felon herself, and Mab relocate their recovery home, renaming it The Next Step, to the vineyard hills of Santa Rosa, CA. In the transition, a moldy old cookbook surfaces, over which lives could be lost. Just when the women think they’re out of danger, fate comes calling. Karma happens—often at the end of a lifetime of manipulation and betrayal. Sometimes we’re not around to witness it; sometimes we are. 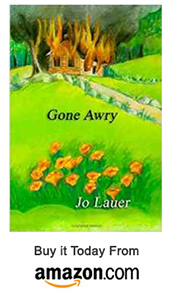 In Gone Awry—the last book in the Best Laid Plans series—we meander through Florence’s early life and down the unfolding path that led to the buried treasure in Best Laid Plans over which lives are lost. Will Florence have her final revenge on the women of The Next Step halfway house who she believes are holding her money ransom? 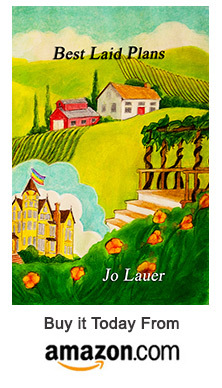 Santa Rosa–based psychotherapist Jo Lauer applies her knowledge of the human psyche to a new genre in ‘Best Laid Plans: A Cozy Mystery’ (CreateSpace; $11.69). 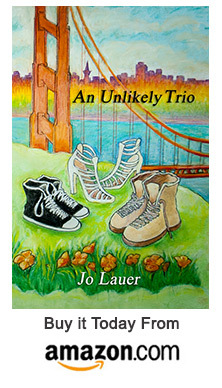 Her story begins with Jenny Pond, an ex-felon who “hadn’t planned to kill anyone, but fate has a lousy sense of humor.” Jenny meets Shalese, a blue-collar social worker from Detroit, and the two fall in love as they work together at the First Step, a recovery house in San Francisco. Things go afoul when Florence, a wealthy benefactress with a particularly unsavory history, comes along, forcing the relocation of the recovery house to Santa Rosa. Like Orange Is the New Black for the wine country set, the book’s characters—mostly women who’ve spent time in jail for various offenses—only get deeper into mystery and adventure after the big move.—L.C. Is it fate or sinister manipulation that connects trust-fund baby Jenny, who murdered a man with the heel of her shoe, Shalese, a blue-collar social worker intent on setting up a halfway house for female ex-felons, and Florence, a wealthy octogenarian who offers to fund the whole venture only to leave them high and dry without means to survive? Betrayal, murder, and mayhem threaten to tear asunder the thirteen women of The First Step recovery house.